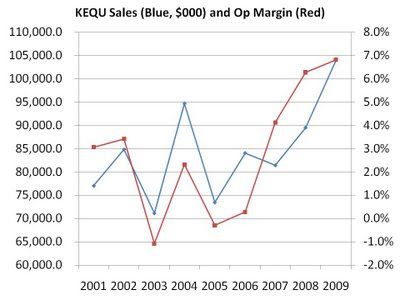 Indeed, this type of analysis suggested the company's 2009 margins and revenue growth were not sustainable, and that turned out to be the case. In the latest quarter, the company saw sharply lower revenue and margins, and of course blamed "a soft market for small laboratory furniture projects, and unusually bad weather". This management behaviour of "take credit when things go well, blame others when things go badly" is nothing new and is not limited to this one company; rather, it is common business practice. As such, as investors it's our job to think beyond what we hear from the managers. What are your thoughts on ACU's ability to maintain a ROIC greater than its cost of capital given that most of its products are a relatively commoditized industry? You made a lot of great points here and the messages management sends out when outperforming the market and when they underperform tells us a lot about their level of honesty and transparency. When we invest in a company, what we're really buying is like a foreign currency. It's a piece of paper with the CEO and CFO's portrait on the front and company logo on the back. You are counting on them to not dilute the currency (inflation) and you want it to be redeemable for future goods and services (hold value or appreciate). I'm not going to hand $20 to someone who won't pay me back and investing is no different. I won't hand the CEO and CFO to run a business with me $20 unless I absolutely trust them. I don't care _at all_ about what the industry norm is - I want executives who are honest and transparent - show consistency with it too. Don't be honest and transparent only when things go well, but also when things go bad. Taking credit when things go well and passing the blame when things don't go so well is not a good indicator of strong character and will weigh heavily on the price I'm willing to pay for an investment. This is probably why I like managers who focus on increasing intrinsic value and not the stock price. In the long run, the two will meet, a focus on the stock price will only work in the short term though. I do believe that it's in management's own interest to be transparent, because it encourages people to own the stock on a long term basis and not just trade it on a daily basis. When things don't go well, these are the guys who will buy more because they're betting on the jockey rather than the horse - they know him/her to be honest and transparent and so they will invest their money alongside management's time, effort, and sweat. gr8 ideas ankit! wish there was sum way 2 quantify or atleast sum method 2 tangibly demonstrate dis dan luking at d adjectives in d annual report? Rayhaan - I haven't looked into quantifying the ethics and character of management through the annual report, that's a very good idea actually. I will say that Warren Buffett writes an amazing annual letter that shows his honesty and transparency. Maybe looking for those comments will help? Buffett admits mistakes - look at what it takes for anyone else, even BP, to admit a mistake openly. It should not require our government - just come out and apologize, or state why you're better off with some failures. Maybe one metric is looking at how many footnotes there are of importance that management doesn't discuss on conference calls? I used to run a business and so when I talk to management, I have a few key questions I'll ask. They are very tough questions and I will keep the answers private, but the people who have honest answers are the folks I'll work hard with. It's a tough filter and unfortunately, there are very few that pass. These questions are not about the business, but themselves. I will say that the CEO of PRLS has passed this test. He doesn't even return my calls anymore, and I take that as a good sign - he shouldn't until there's some benefit for him. I'm getting a little off topic, but I want people who have a _long term greed_. I want the greediest of all people, the most selfish managers out there. The good ones know what works and what doesn't. If you become narcissistic, you focus on the short term and end up harming those around you AND yourself. (Accounting fraud, revenue manipulation, etc.) If you're truly the greediest of them all, you will focus on the long term. You aren't in this game to make $5-10M and cash out after pumping the price up, but rather someone who wants to make $50M even if it takes 10x as long. The guy who pumps it up and walks away with $5-10M will not be as successful in the long run, because investors will see his past track record. The manager who took his time building intrinsic value will see long term success that his competitors cannot even imagine. As I said, I want really greedy people who do what is in their self interest, because they realize that whenever they make a buck, it's because someone else saw value worth more than that buck, so they're both better off. If they have that and it's a long term focus, I'll pay attention. Investing is a tough thing for me, it's never been easy. My habit is to not swing often, but when I do, to swing large. I believe it is very difficult (moreso than analysts believe) to predict the future, but ACU has clearly managed to do it in the past. What made this a great investment possibility was the fact that a few months ago, the stock price was such that any ROIC over the cost of capital that may occur was offered to the investor for free.